the website, and no profit was made. narrowed by her recent ruling in Digital Cornerstone v. Kevin Carmony. site was owned by the very people I was criticizing, as Carmony did. the website in the Del Junco case. for not erasing every mention of Stutz law firm from my website. case, regardless of whether she thought she could get away with it. lawyers who are suing me on their own behalf. people. It covers a broad range of education issues. Carmony said that, after six years at Linspire, it was time to move on. open CNR (Click N' Run) will be great for Linspire and desktop Linux." forward from here," Carmony added. locate. Thank you. -- Richard"
he was able to get an okay from one of them at around 2:28 p.m.
last e-mail, the check has arrived. Thank you. -- Richard"
Two days ago I had served Stutz with a check for $3000 for sanctions. after Dumanis took office in 2003. Bonnie Dumanis was so outraged. 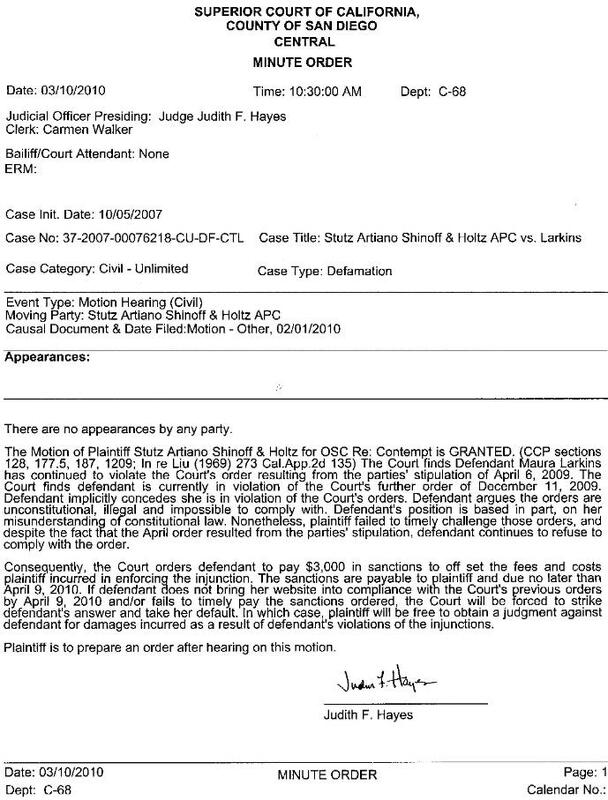 wondering why Judge Hayes did this. to appropriately apply the law. There was no gag order in this case, nor was there a temporary injunction. mention the name of Stutz, Artiano, Shinoff & Holtz law firm.